Started in the early afternoon Sziget’s island filled up with real music lovers, waiting for the best metal artists, mostly legendically from Scandinavia. But trying to not get any one-lined stereotypes, check all the great bands out, who played fantastic gigs at that big Hungarian Metal Day. Hungarian all-music festival, called Sziget won the best European major festival award int he year, celebrated its 20th year. Every time Sziget Festival renew itself, to show something more nd more from year to year for thousands of visitors, coming to party an enermous int he middle of summer. So, in this anniversary year they took the lead on the top, serving 3 pre-day, in 3 different kind of music topics at all. The second of this days was the upper mentioned hard sounds lover’s day..
By the way.. mixing layers of hard music, Hungarian Superbutt had the first hour to show, that sometimes short lifetime of a band also enough to write excellent sounds. Superbutt band was formed in 2000, as the youngest artist of that day, giving pretty pleasant entertainment for the hungry metal-population there. But how far could good music fly? Really good question-, added by the next bands. Two Mediterranean group also showed up some interesting facts in line, from the warmest part of our continent. Portugalian Moonspell proved, Italian Lacuna also did it. Anyway for me is always hard to understand and pass together eternal summer feeling with heavy metal world, but there are always miracles, we know it well. So I experienced again, summer could also means metal songs, then love ones. Strange, but true. Next production, called Ignite, pretty famous- became well-known from the last century- sounds really old, they are working together 20 ys soon- proudness: with a Hungarian vocalist. 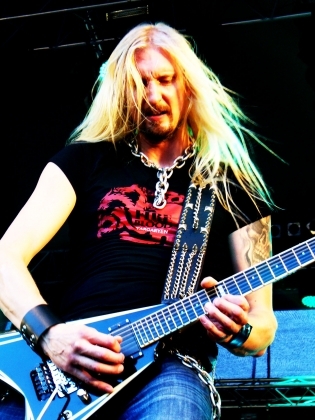 Their melodic-metal calms down minds, preparing them to the evening’s stars- lets say out subjectively my big-big favorites, Swedish Hammerfall, as hero-metal, with the glory of Scandinavia. It was a journey in the time, during the history of band, with great hits. Audience was in magic, sing all the well-known and well-understood songs and lyrics. 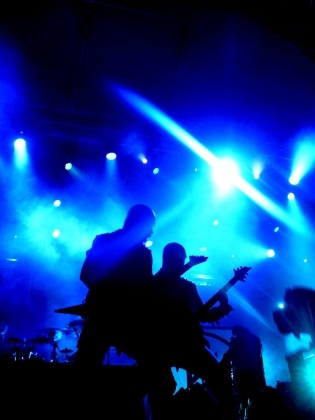 Swedish metal was followed by the Norwegian symphonic black metal Dimmu Borgir band as the second biggest name of the night. As we were in a thriller movie, saw figures- great scenery, and mask. Finale like in a real gigantic music-theatre. Beautiful, and memorable, but really strong. As all days around that festival. But its started just now. Hey ho, let’s go!